Exercise treadmill is a great way to burn calories, stay in shape and achieve your daily exercise session. With treadmill exercise there are no excuses why you can't exercise daily. The benefits of owning a treadmill or using a treadmill is that you can walk, jog or run for mails without worrying the weather condition or whether is too late or safe. Exercise treadmill you can control exactly how far and how fast you go and you can incorporate hills at a whim, as often or as steep as you want, and simply get the benefits of aerobic exercise without leaving your home. With treadmill exercise you can walk, brisk walk, run or even train for marathon at a pace you are comfortable with, the exercise is customized to match your preference. Effective exercise treadmill can also be adapted depending on whether you wish to burn fat or gain fitness; you easily adjust the speed level to make the heart work harder for fitness or slower for fat burning. Many people think exercising on a treadmill is limited to walking or running, you can make your treadmill workout as challenging as you would like. There are different types of treadmill exercise program you can do for intense workout treadmill; session, a word of advice before you attempt any of the following workouts consult with your personal trainer or doctor whether you're fit for the following exercise routines. Walking backwards on a treadmill is tricky and challenging, if you are a beginner or have muscular joint or medical problems please consult your doctor before attempting. When you run or walk backwards, the muscles in your joints move differently, first start slowly and be very careful as you will be off balance. Do not hold on the handrails when you walk or run backwards, you can damage your shoulders, running forward and running backwards are very difference so be very careful on how you support balance. This type of exercise can make you develop new muscles, but be warned it can be painful exercise routine. For more tips on walking or running backwards on treadmill take a look at this site. If you think treadmill exercises is boring then try walking on toes and heels and see if you are up the challenge. This type of treadmill exercise is easy to do and will give your lower muscles and feet a workout. First start walking with your normal routine, after 5 to 10 minutes raise yourself up on your tiptoes and walk for thirty seconds and return to your normal walking for another 5 to 10 minutes. Then do the same routine on your heels, repeat this routine two more times and you will definitely feel the results. Treadmill incline intervals are great way to get your daily aerobic exercise; it involves using the incline setting on your machine. Incline intervals training are more suited to treadmills that have automatic incline adjustment. With incline programs you focus on varying the incline on which you are training, first warm up, then walk for five minutes, then raise the inline about 5 to 6 and continue working-out at this incline for five minutes. Repeat the routine two more times and you will receive the maximum benefit of the workout. Speed interval treadmill training on a treadmill is excellent example of a good aerobic workout, it pushes your cardiovascular system to the limit; it improves your heart's stroke volume, increases your blood supply to your muscles and enhances muscular strength. First warm up by stretching before you start speed interval training. For intense speed interval training, walk or run as fast as you can for one minute. Then slow the pace down for a two minutes, and then do another minute at full speed. Repeat this routine five to eight times. Exercising on treadmill is mainly running and walking on your legs, to spicy up your workout try dumbbell workout. If you want to pump up your walking workout, to burn more calories or to tone your body better try treadmill dumbbell workout. Weight lifting on a treadmill gives you an upper body workout while walking. Before you attempt this technique consult with your personal trainer, learn a proper arm swing which will give you some upper body toning and help you move faster and easier, it will loosen up your shoulders and neck. When performing treadmill weight training make sure to not hold the handrails, first start slow so that you control your balance, and then slowly increase speed as you gain confidence. At the end of your workout, you will have given your upper and lower body a good treadmill exercise. The goal to successful exercising on treadmill is to have a treadmill workout program you can follow, something that will motivate you and help you achieve your weight loss goal. Treadmill trainer is created by Yuri Eklam one of Canada's top trainers, Yuri knows how to transform a total beginner into an athlete. He does this for a living, and his Mp3 treadmill trainer program is the #1 Mp3 fitness program worldwide. 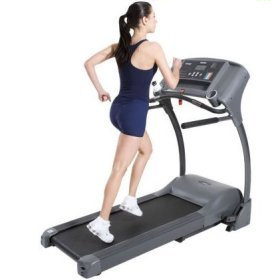 Exercise treadmill is very popular among exercisers, is the easiest and simple way to burn calories and stay in shape. There are different treadmill exercises you can do such as, speed intervals, treadmill dumbbell workout, incline intervals, walking on toes and heels, and walking or running backwards on a treadmill. These types of exercise treadmill spices up your workout routine and will help you beat treadmill boredom. Cut your treadmill workout time to 30 minutes of high intensity exercise. Many people simply don’t exercise because they don’t have time for it, if that is what is holding you back to exercise and be healthy, than I have news for you. What if I tell you rather than exercising one hour you can exercise 30 minutes and still burn equal amount of calories to one hour exercise? Starting a treadmill weight loss program and sticking with it to loose weight isn’t as easy as said than done. Many people struggle to lose weight because of commitment and dedication to weight loss program. I am one of the millions who continuously struggle to loose weight and commit to workout programs. Is your muscles stiff, can’t hardly move or don’t want to do complicated exercise? You not alone, simple stretches you can do anywhere, any time without the use of equipment will help you fight with anti aging.